For anyone with an interest in the beautiful folk costume and decadent fashions of Russia – this is a sumptuously illustrated, and informative new book from Yefimova and Aleshina. My interest in Russian fashion stems from both a love of folk costume and detailing (which is copious in this book), from Natacha Rambova’s fascination with Russian culture and arts (especially the Ballet Russes), but also because of the strong Russian ex-patriot influence on Parisian fashion in early 20th century. Given these interests, and the recently opened exhibition on Russia here in California (at the Sonoma County Museum of Art) and the anniversary of Fort Ross (settled by Russians), it seems appropriate to delve deeper. 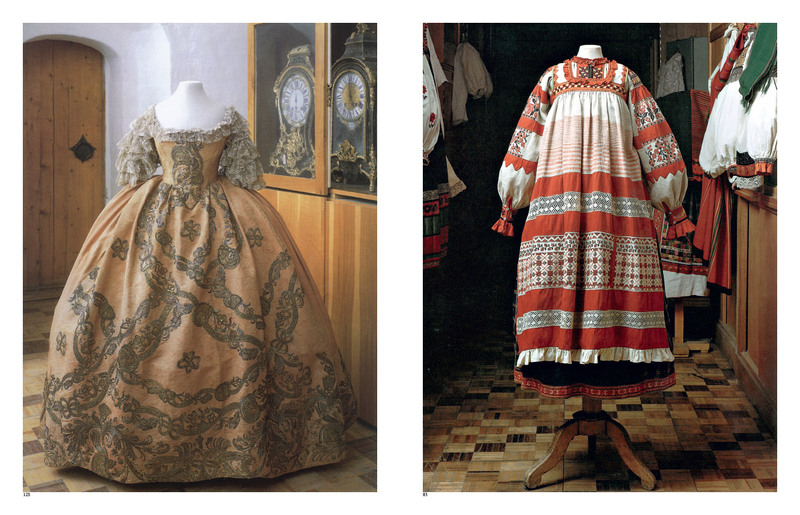 Dress belonging to Empress Elizaveta Petrovna, 1750s, France (left – see note 1) and Peasant Woman’s festive dress, Late 19th-early 20th Century, Yeleski district, Orlov province (right – see note 2). Much of what is included here corresponds with the notion of country and town influencing each other – and what is evident from the photographs is the appreciation held by all classes for intense detailing and decorative elements – Lace, embroidery, brocade, applique, pearls, fur, beading and quilting appears on every kind of clothing, for all ages and all genders. It is a beautifully produced book – and I’m thrilled to be able to share it.